SuperPro VAG Alloy Performance Control Arm Solutions! SuperPro has redesigned and the VAG arm to now fit all of the Alloy sub frame VAG models, like the Audi RS3, Skoda Octavia, VW Golf Mk7 & Golf Alltrack. This arm also fits the new Golf 7.5 and delivers an increase in both Camber and Caster for massively improved front geometry and handling! Fitted with the SuperPro DuroBall rear bushing and for maximum arm control, this arm is the best upgrade available! Caster Increase Alloy Arm with DuroBall Rear Bushing & built in Camber Change - Exclusive to SuperPro. 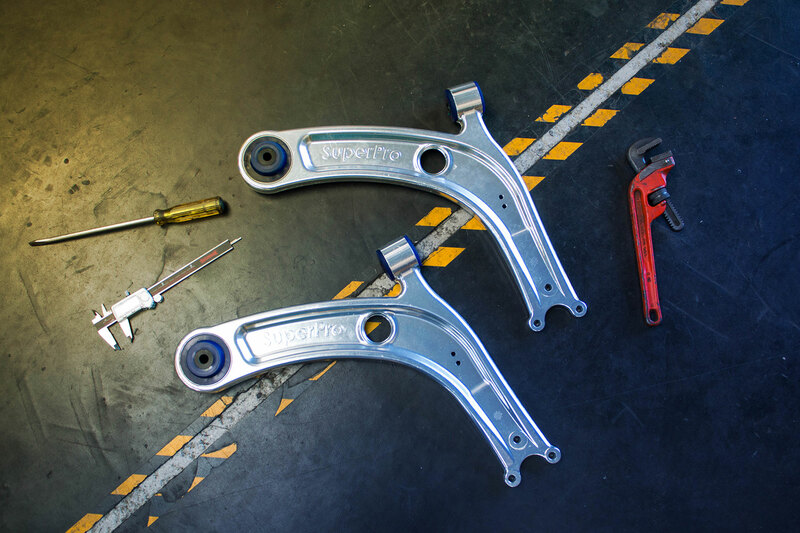 Alloy - 38% lighter than OEM Steel Arms SuperPro Alloy Control Arm Assemblies deliver more caster, camber and eliminates unwanted flex. Fitted with the SuperPro DuroBall rear bushing and for maximum arm control, this arm is the best upgrade available! SuperPro Tip: Care needs to be taken with aggressively lowered vehicles with non standard tyre and wheel packages to avoid tyre/guard contact.